Do you sometimes buy fruit or vegetables because of its color? I find myself putting yellow and orange stuff into the basket. Mandarins, oranges, butternut squash is what I buy by the kilo these days. It's not quite in season (and will never be in season here in Dubai anyway), but I am craving autumn and winter fruit. It's probably my unconscious self telling me it had enough of the summer heat, humidity and sweating. I felt like having something spiced, so I went to search for Moroccan or Indian butternut squash recipes. And I find the Indian Summer Stew on The Food Network. How can one not like this? Is it Indian Summer - Stew or an Indian - Summer Stew? The ingredients list is incredibly non-demanding and I could start cooking the soup without even going to the shops. 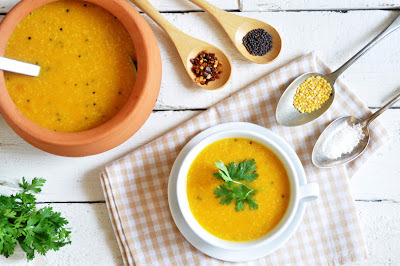 The result is an incredible soup with so many dimensions that I like: The dal gives the soup a lovely thickness, but still retains some bite. The butternut adds sweetness and is heavenly in combination with the coconut. The spices round it all up and keep the soup together without overpowering the dal, butternut and coconut. I found that the soup gets even better after reheating. A new favorite of mine that will surely make onto my Autumn Favorite list. Rinse the split peas in a couple changes of water. In a large soup pot, combine the squash, drained split peas, tomato, coconut, turmeric, cumin, and enough water to cover. Bring to a boil, and then simmer, covered, 20 minutes. Remove the cover and simmer another 10 minutes. To temper: In a small skillet, warm the coconut oil until shimmering. Add the mustard seeds and when they stop popping, add the red pepper flakes, garlic, and salt. Swirl the skillet so the contents cook evenly, and cook another 10 seconds. Then pour the contents of the skillet into the soup, along with the salt. Spoon a ladle full of soup back into the skillet (it will sizzle, be careful! ), and pour back into the soup pot. Adjust the seasonings, to taste. Garnish with chopped cilantro.